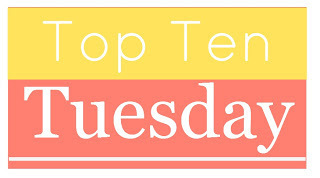 For future Top Ten Tuesday topics & info on how to participate, click here! 1. The Geek's Guide To Unrequited Love by Sarvenaz Tash: This cover is AWESOME and it sounds all kinds of warm and fuzzy and funny to me! 2. A Court of Mist and Fury by Sarah J. Maas: OBVIOUSLY this is on my list. I'm betting it will be on lots of lists ;) I need more of this world! 3. Flamecaster by Cinda Williams Chima: I have SO much love for the Seven Realms series and I will devour this new series set in the same world. Because obviously. 5. The Inquisition by Taran Matharu: I feel like The Novice, the first book in this series, hasn't gotten much buzz and you should all really get to reading that because it was SO good! It has a boarding school and cute demons and just lots of awesomeness and I can't wait to find out what happens next!! 6. Sycamore Row by John Grisham: I've been devouring A Time to Kill over Spring Break, so I definitely need to pick up the sequel! 7. Ruby by Cynthia Bond: I have owned this one for a while. I almost picked it up to take on a short getaway, but didn't. I will have to in the very near future. 8. The Grapes of Wrath by John Steinbeck: This is one of my favorite books of all time. I love the imagery and the deeper meanings. I love the feelings that this novel evokes. I try to revisit it every couple of years. 9. West of Sunset by Stewart O'Nan: This one takes a look at the last couple of years of F. Scott Fitzgerald's life, which he spent mostly out in Hollywood. Fitzgerald is one of my favorite authors and I have something of a weakness for these reimagined biographical fictions. It recently came across my radar and I bought it immediately. 10. The Last Love Song by Tracy Daugherty: I mentioned this title in my post from last week about Joan Didion, but I felt it needed mentioning a second time because I am so excited about this book! What's on your TBR for this Spring? Very excited to read A Court of Mist and Fury later this Spring as well! I forgot about The Geek's Guide To Unrequited Love. Looks so cute. I need to make sure I add it to my TBR. I also would like to read A Court of Mist and Fury, and forgot to put that on my own list :) Good series. Thanks for sharing your selections. I will be reading ACOMAF but I picked for my top 10 books I am reading this month of my spring list just so I could narrow it down. Great list and some I am dying to read!!! So can't wait for ACOMAF!! LOVED the first book! Great picks! Get free dogecoin from this website. Great list! I'm hoping to try and finish ACOTAR before the second book comes out! I read West of Sunset last year and it was very sad and fascinating. Enjoy! Even when I'm not too attached to the characters, Maas makes me want to keep reading. Otherwise, I don't have any others on my radar, but will look into them! Also, love this TTT because it connects you with kindred reading spirits! You can tell with a quick glance whether you have common interests, etc. Great list of books! I'm definitely going to check some of them out. Thank you so much for hosting TTT. The Geek's Guide To Unrequited Love almost made my list, but not quite. But it is high up on it.